Simon Grand scored the only goal of the game as Chester won 1-0 at Darlington last night to complete the double over the Quakers. The Blues remain five points off a play-off place in ninth position in the league. The breakthrough came five minutes before the break with Grand heading home from close range following a delightful well-worked free-kick routine. Chester had goalkeeper Grant Shenton to thank for a series of fine saves to preserve the three points and keep the play-off hopes alive. Tickets continue to be on general sale for the home match against Stockport County on Tuesday 9 April, kick-off 19.45hrs. The ticket office is open daily form 10.00-16.00hrs. Season Ticket holders do not need an additional ticket. NO tickets will be sold on the day of the match. On Wednesday night at an open meeting at the club, The Chester FC Community Trust unveiled plans for a new £1.6m community sports hub to be built in Blacon behind the police station on the site of the King George V playing fields. The facility will also be the home of the Chester FC Academy. The Trust have been working alongside Cheshire West and Chester Council on the scheme which proposes a full size floodlit 3G pitch, a new clubhouse to include changing rooms and community facilities as well as improving the current grass pitches and existing facilities on site with an additional new car park and improved access. The plans are subject to receiving planning consent. Funding for the scheme is being met by several sources including the council, national bodies and a further donation of £200,000 from local businessman Stuart Murphy. The remaining £300,000 for the project needs to be raised through fundraising activities and donations.  More details and an opportunity to make a donation to the project can be found on the King George V Sports hub website. Chester’s away league match at Darlington has now been rearranged for Wednesday 27 March, kick-off 19.45hrs. Supporters and the public are invited to an open meeting this Wednesday night, 20 March, at the Blues Bar where the Chester FC Community Trust will present an update of their plans to develop a new community sports facility in Chester. The meeting will start at 19.30hrs. Heavy overnight rain has left the pitch at Darlington waterlogged so today’s league match there has had to be postponed. A new midweek date for the fixture will be announced soon. Forward Nathan Brown has left Chester and joined former manager Neil Young at Evo-Stik Premier League Marine. Brown was released recently after mutually agreeing to cancel his contract. Brown, a product of the Chester Youth Academy, made 3+7 appearances scoring 4 goals and has had loan spells with both Colwyn Bay and Ramsbottom United. Chester missed the opportunity to close the gap on their play-off rivals when they were pegged back by ten-man Leamington on Saturday. Striker Akwasi Asante made a return to the starting X1 though looked short of match fitness and was replaced midway through the second period. After an uneventful first half midfielder Ben McKenna opened the scoring for Chester two minutes into the second period following good build up play by Matty Waters and Anthony Dudley. The Brakes were reduced ten men in the 80th minute with Jordan Murphy receiving a second yellow card. Despite this setback the visitors were on level terms three minutes later with Ahmed Obeng shooting past Grant Shenton from the edge of the area. Chester remain in ninth place and are now five points off the play-off’s. They are next in action on Saturday when they travel to Darlington, kick-off 15.00hrs. 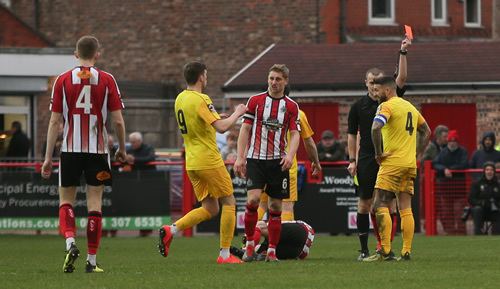 Chester were beaten 4-0 at Altrincham on Saturday, conceding all four goals in the second half after captain Scott Burton was sent-off following two yellow cards in the 50th minute. Altrincham opened the scoring through Joe Piggott 60 seconds later and there was to be only one winner from then on. Two further goals from Josh Hancock and a last minute John Johnston strike completed the scoring. Chester had the better of the possession in the first half though clear-cut chances were few and far between against their play-off rivals. With Stockport County reaching the semi-final of the FA Trophy, the home league game against them scheduled for Saturday 23 March has now been rearranged for Tuesday 9 April, kick-off 19.45hrs. Note that this match will be ALL TICKET.